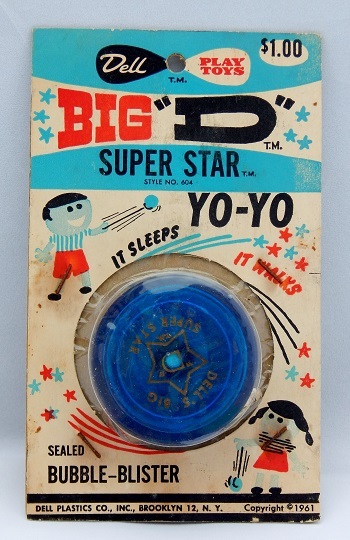 Stamp on the translucent dark blue yo-yo says DELL'S BIG "D" (TM) SUPER STAR. What appears to be a small, light blue jewel in the center of the "D" is actually the silver metal axle showing through near the surface of the blue plastic. A very hard to find yo-yo nowadays. Compare with the Dell Butterfly-No. 604. Why this Super Star model and the Butterfly model use the same style number on their respective packaging is unknown. One theory is that the name "Butterfly" originally came from Duncan Yo-Yos and was considered a trademark; Dell may have decided to drop the name "Butterfly" from their packaging and yo-yo and instead use "Super Star" to avoid litigation from Duncan. Originally retailed for $1.00; uses a metal axle with a starburst response.